2 SCREEN CONSTRUCTION Use of film to detect x-rays and to image anatomical structures is inefficient. 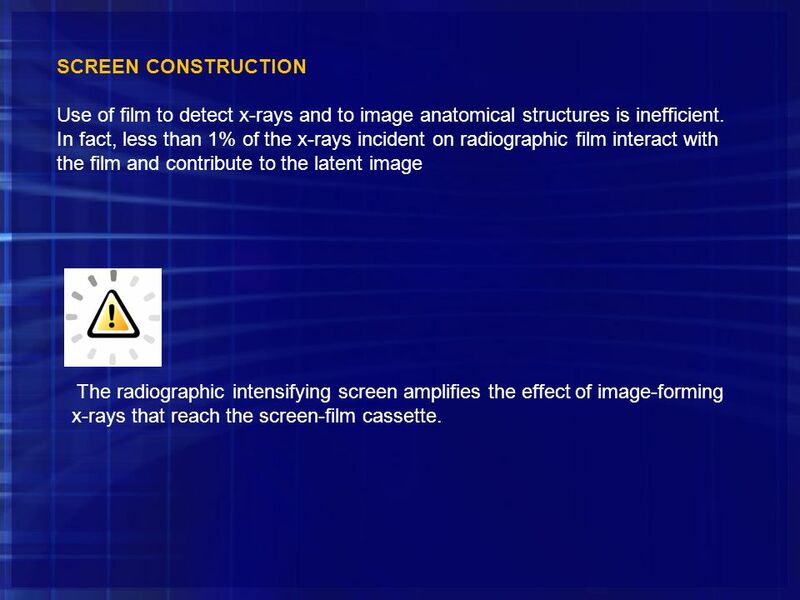 In fact, less than 1% of the x-rays incident on radiographic film interact with the film and contribute to the latent image The radiographic intensifying screen amplifies the effect of image-forming x-rays that reach the screen-film cassette. 3 The intensifying action of screens can be described by a formula called the intensification factor (IF). 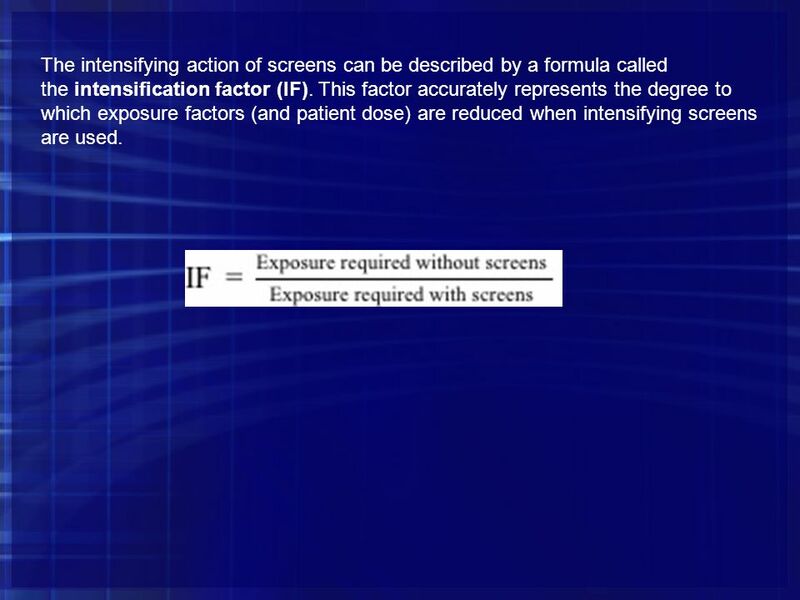 This factor accurately represents the degree to which exposure factors (and patient dose) are reduced when intensifying screens are used. 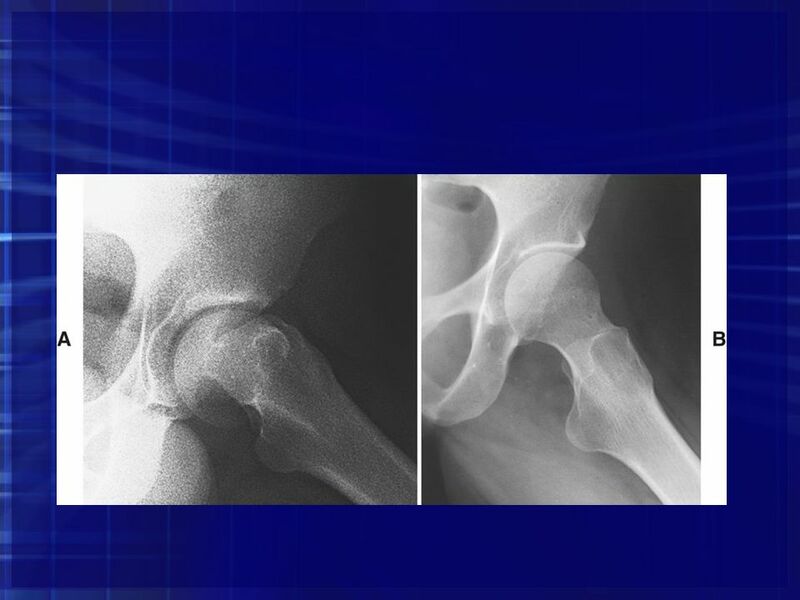 4 On the one hand, use of a radiographic intensifying screen lowers patient dose considerably; on the other hand, the image is slightly blurred. With modern screens, however, such image blur is not serious. 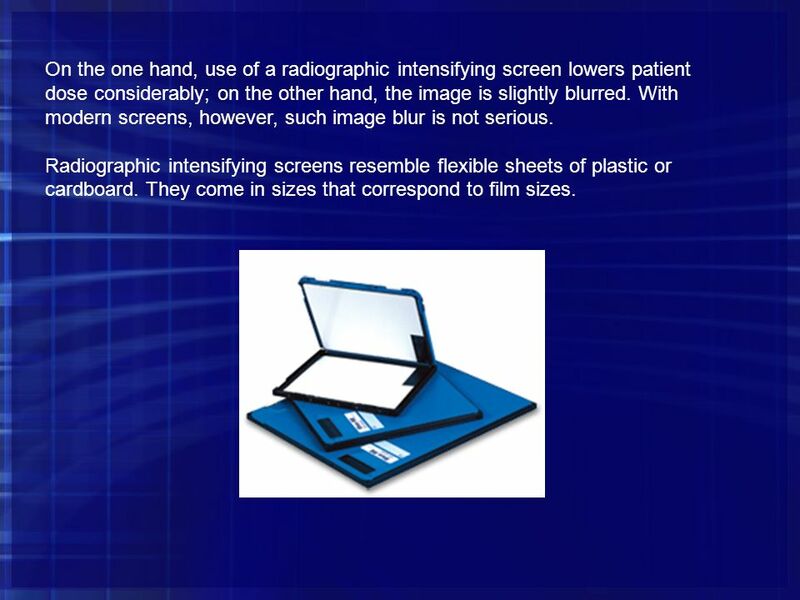 Radiographic intensifying screens resemble flexible sheets of plastic or cardboard. They come in sizes that correspond to film sizes. 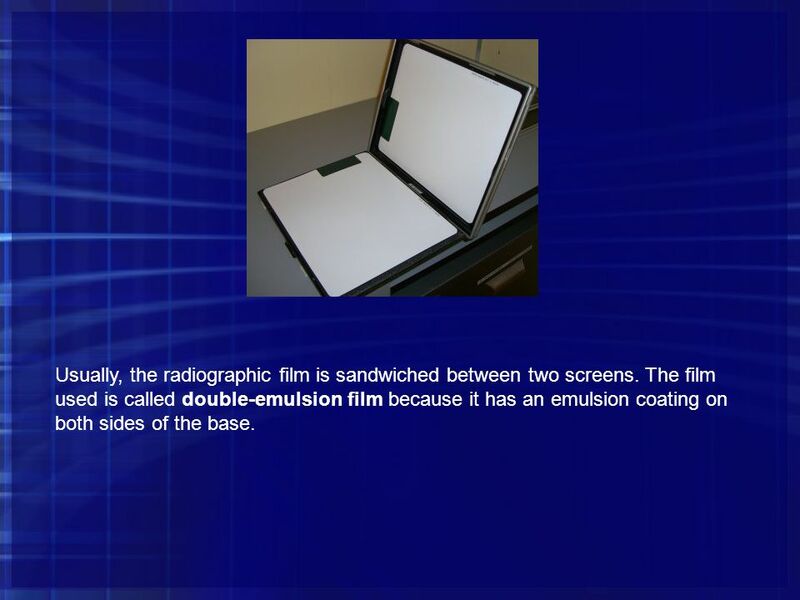 Usually, the radiographic film is sandwiched between two screens. The film used is called double-emulsion film because it has an emulsion coating on both sides of the base. 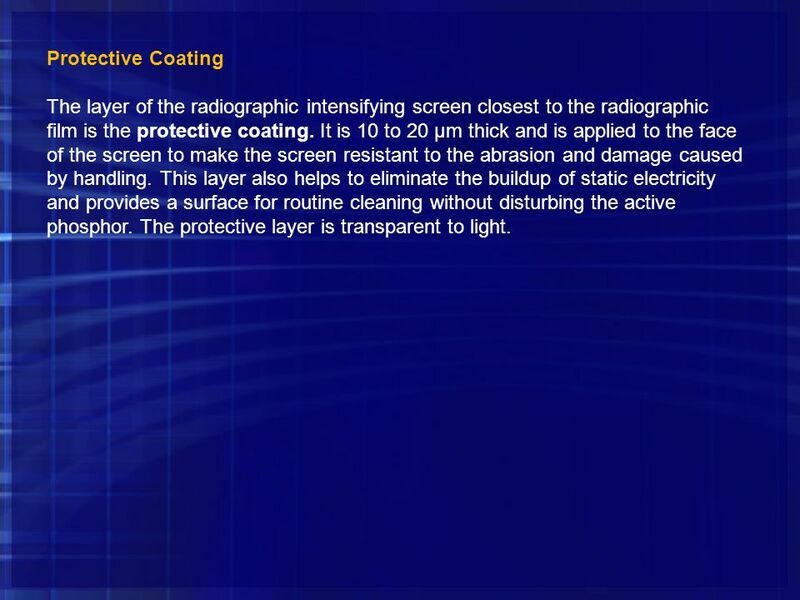 7 Protective Coating The layer of the radiographic intensifying screen closest to the radiographic film is the protective coating. It is 10 to 20 μm thick and is applied to the face of the screen to make the screen resistant to the abrasion and damage caused by handling. This layer also helps to eliminate the buildup of static electricity and provides a surface for routine cleaning without disturbing the active phosphor. The protective layer is transparent to light. • The phosphor should have a high atomic number so that x-ray absorption is high. This is called detective quantum efficiency (DQE). 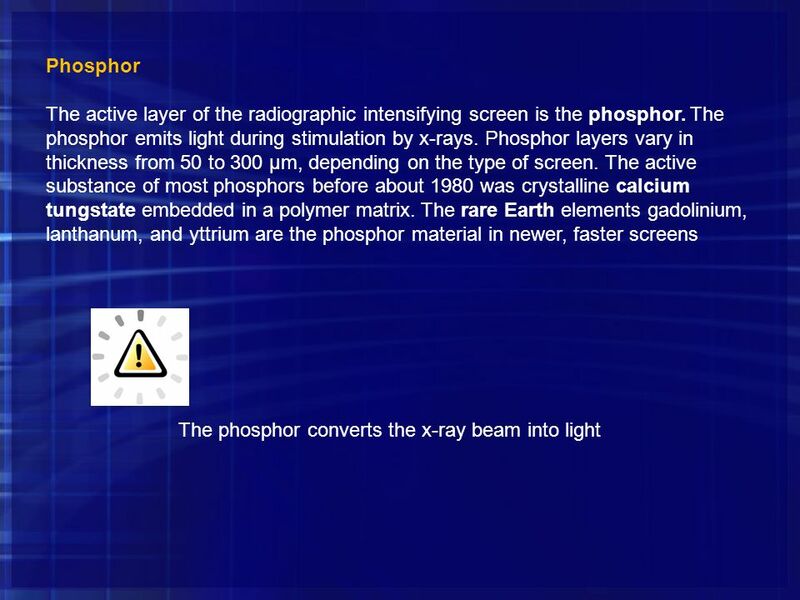 • The phosphor should emit a large amount of light per x-ray absorption. This is called the x-ray conversion efficiency (CE). • The light emitted must be of proper wavelength (color) to match the sensitivity of the x-ray film. This is called spectral matching. 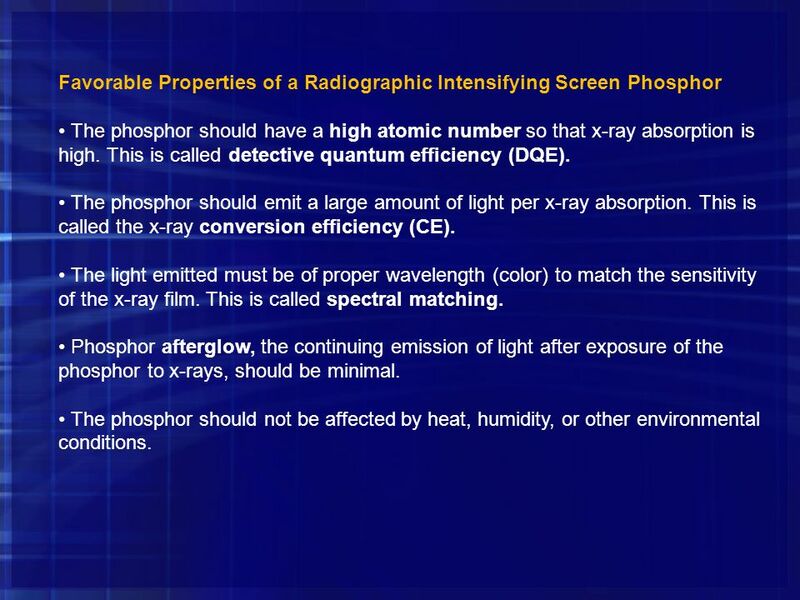 • Phosphor afterglow, the continuing emission of light after exposure of the phosphor to x-rays, should be minimal. • The phosphor should not be affected by heat, humidity, or other environmental conditions. The American inventor Thomas A. Edison developed calcium tungstate. Although Edison demonstrated the use of radiographic intensifying screens before the beginning of the 20th century, screen-film combinations did not come into general use until about the time of World War I. With improved manufacturing techniques and quality control procedures, calcium tungstate proved superior for nearly all radiographic techniques and, until the 1970s, was used almost exclusively as the phosphor. 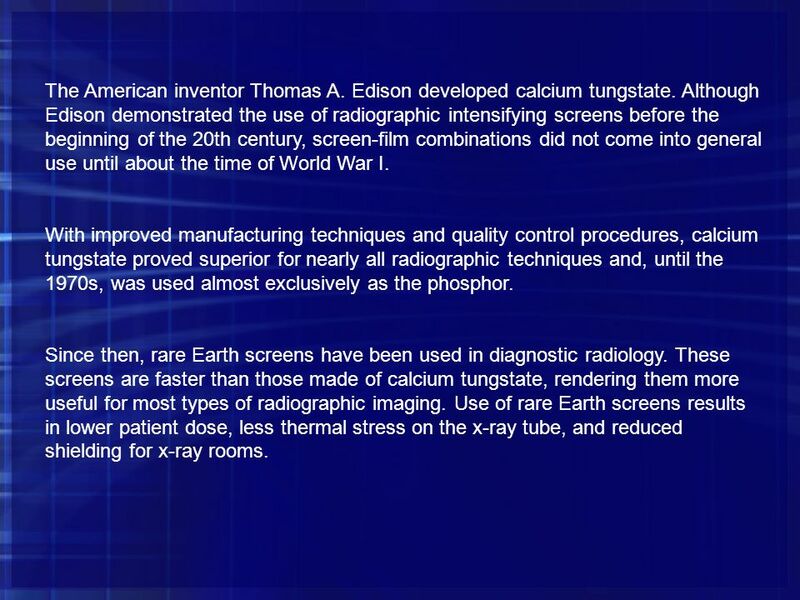 Since then, rare Earth screens have been used in diagnostic radiology. These screens are faster than those made of calcium tungstate, rendering them more useful for most types of radiographic imaging. Use of rare Earth screens results in lower patient dose, less thermal stress on the x-ray tube, and reduced shielding for x-ray rooms. 11 Reflective Layer Between the phosphor and the base is a reflective layer. approximately 25 μm thick, that is made of a shiny substance such as magnesium oxide or titanium dioxide. When x-rays interact with the phosphor, light is emitted isotropically. Less than half of this light is emitted in the direction of the film. The reflective layer intercepts light headed in other directions and redirects it to the film. 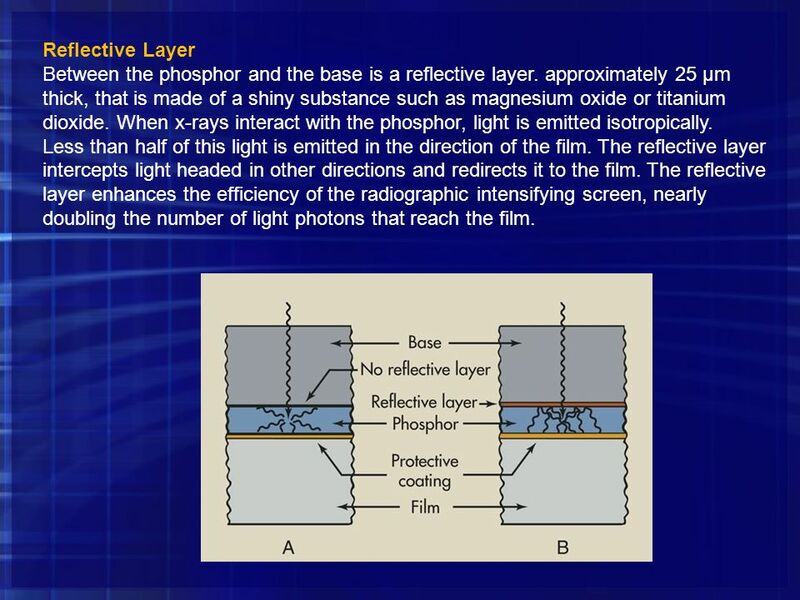 The reflective layer enhances the efficiency of the radiographic intensifying screen, nearly doubling the number of light photons that reach the film. 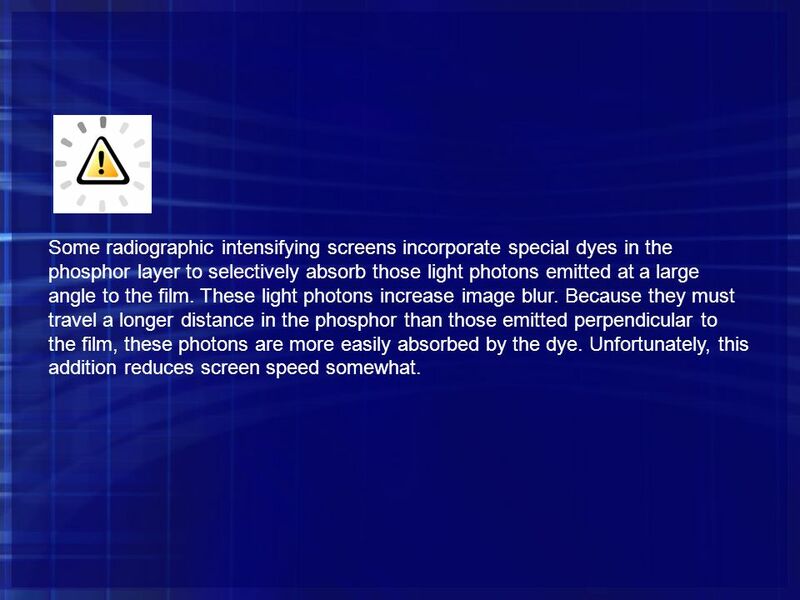 12 Some radiographic intensifying screens incorporate special dyes in the phosphor layer to selectively absorb those light photons emitted at a large angle to the film. These light photons increase image blur. Because they must travel a longer distance in the phosphor than those emitted perpendicular to the film, these photons are more easily absorbed by the dye. Unfortunately, this addition reduces screen speed somewhat. 13 Base The layer farthest from the film is the base. 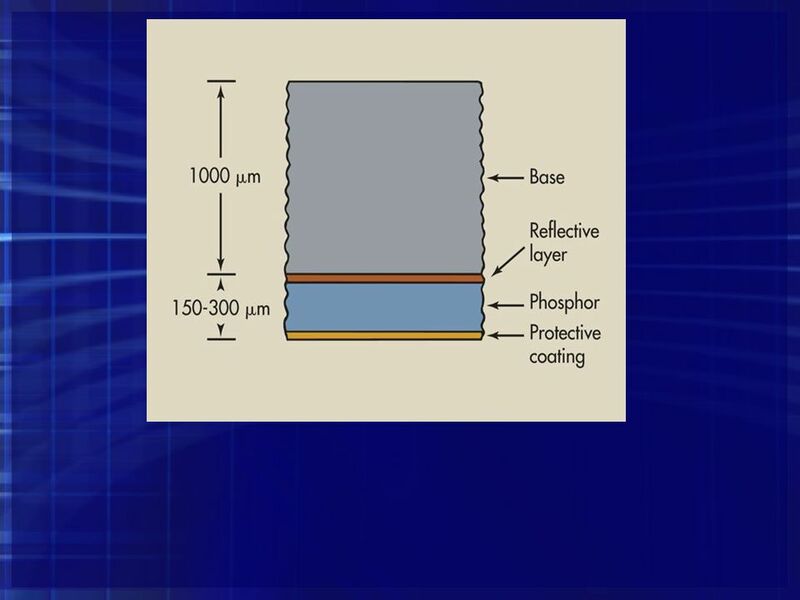 The base is approximately 1 mm thick and serves principally as a mechanical support for the active phosphor layer. 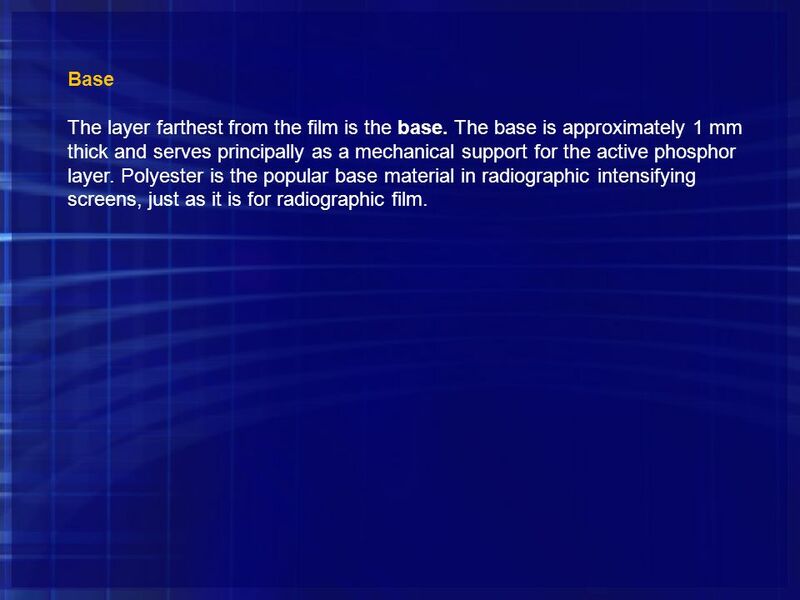 Polyester is the popular base material in radiographic intensifying screens, just as it is for radiographic film. 15 Any material that emits light in response to some outside stimulation is called a luminescent material, or a phosphor, and the emitted visible light is called luminescence. 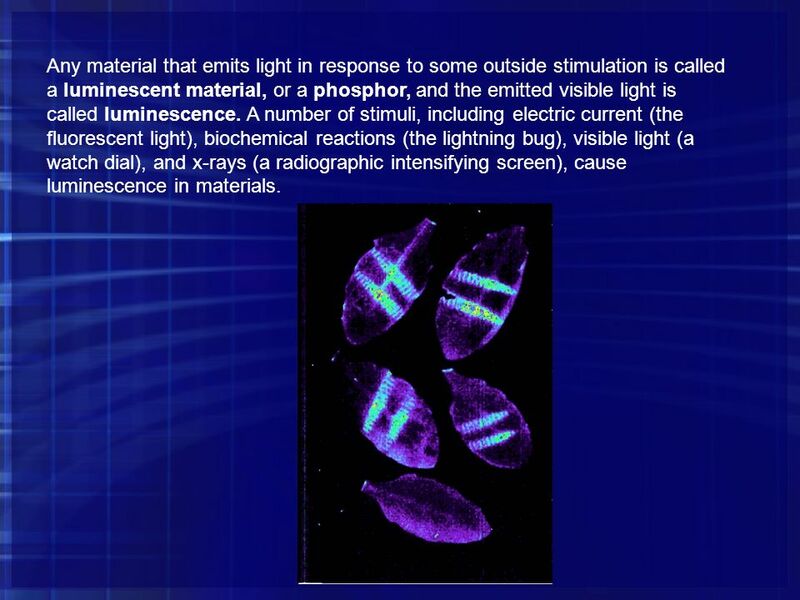 A number of stimuli, including electric current (the fluorescent light), biochemical reactions (the lightning bug), visible light (a watch dial), and x-rays (a radiographic intensifying screen), cause luminescence in materials. Two types of luminescence have been identified. 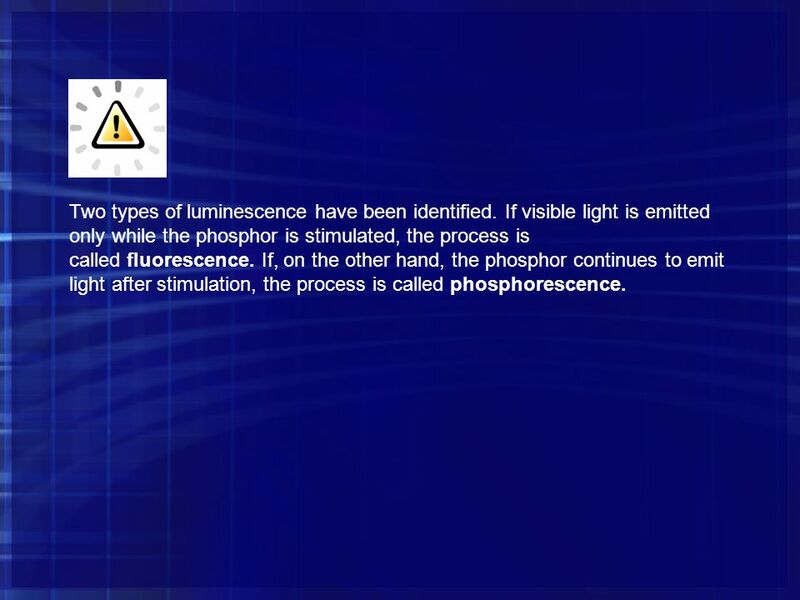 If visible light is emitted only while the phosphor is stimulated, the process is called fluorescence. If, on the other hand, the phosphor continues to emit light after stimulation, the process is called phosphorescence. 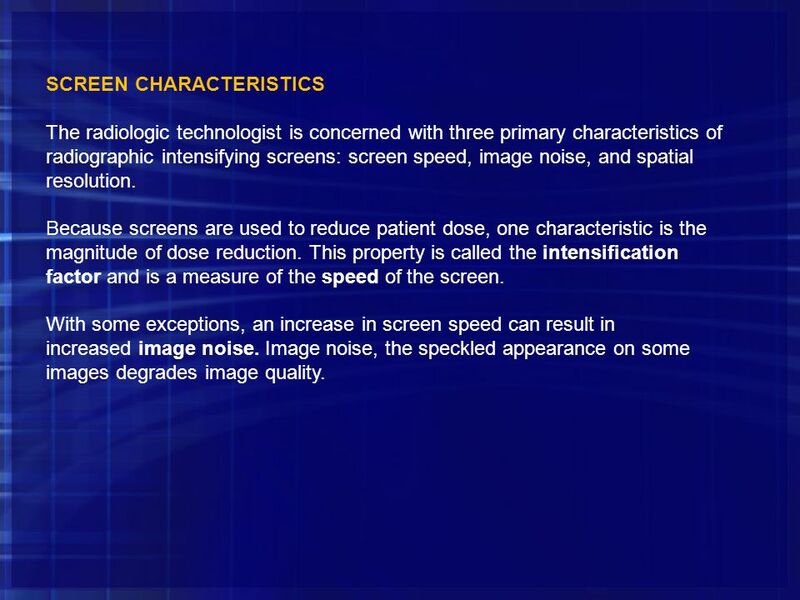 The radiologic technologist is concerned with three primary characteristics of radiographic intensifying screens: screen speed, image noise, and spatial resolution. Because screens are used to reduce patient dose, one characteristic is the magnitude of dose reduction. This property is called the intensification factor and is a measure of the speed of the screen. With some exceptions, an increase in screen speed can result in increased image noise. Image noise, the speckled appearance on some images degrades image quality. 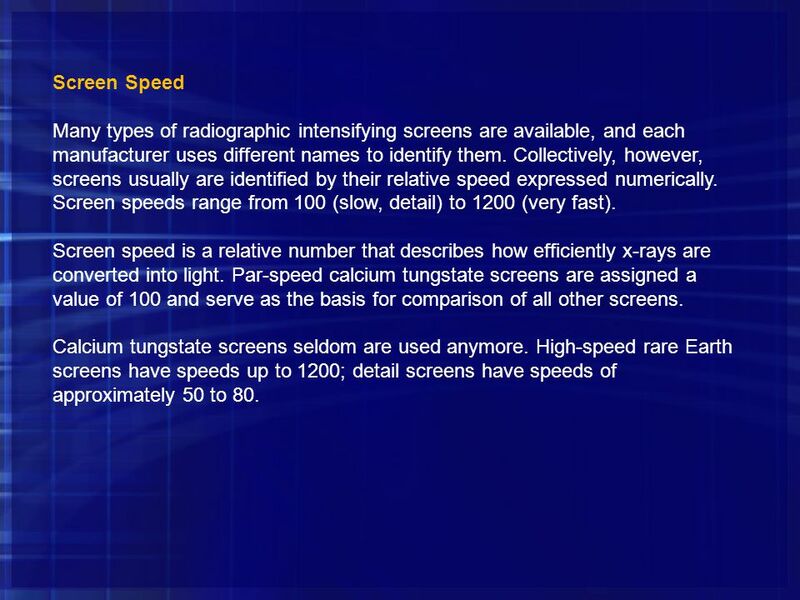 18 Screen Speed Many types of radiographic intensifying screens are available, and each manufacturer uses different names to identify them. Collectively, however, screens usually are identified by their relative speed expressed numerically. Screen speeds range from 100 (slow, detail) to 1200 (very fast). Screen speed is a relative number that describes how efficiently x-rays are converted into light. Par-speed calcium tungstate screens are assigned a value of 100 and serve as the basis for comparison of all other screens. Calcium tungstate screens seldom are used anymore. High-speed rare Earth screens have speeds up to 1200; detail screens have speeds of approximately 50 to 80. 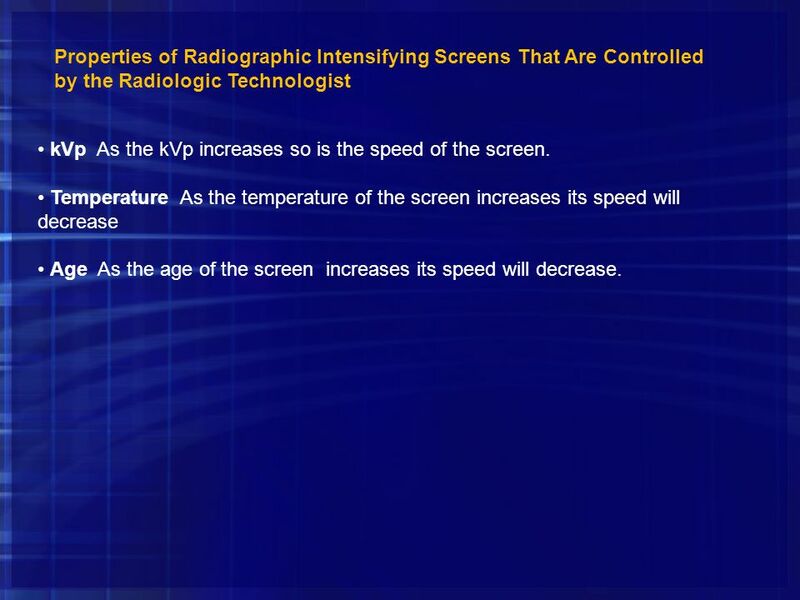 19 Several factors influence radiographic intensifying screen speed; some of these are controlled by the radiologic technologist. 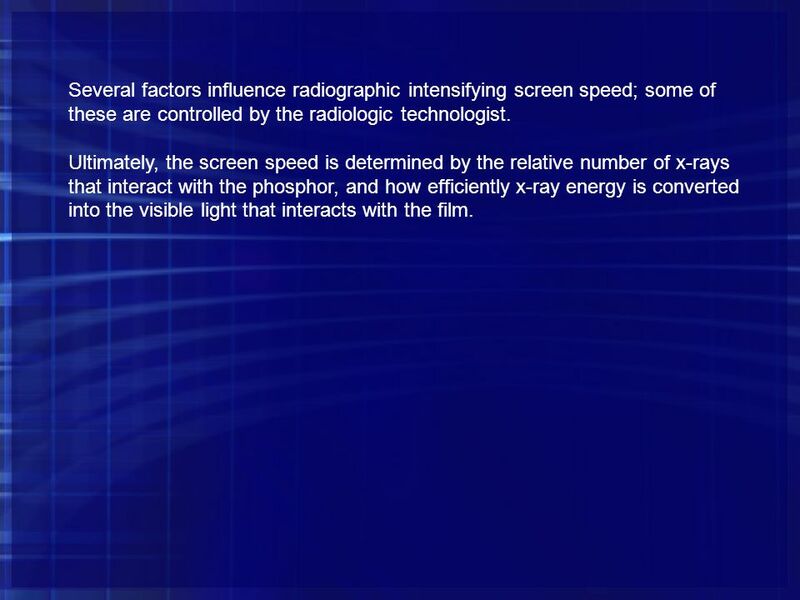 Ultimately, the screen speed is determined by the relative number of x-rays that interact with the phosphor, and how efficiently x-ray energy is converted into the visible light that interacts with the film. 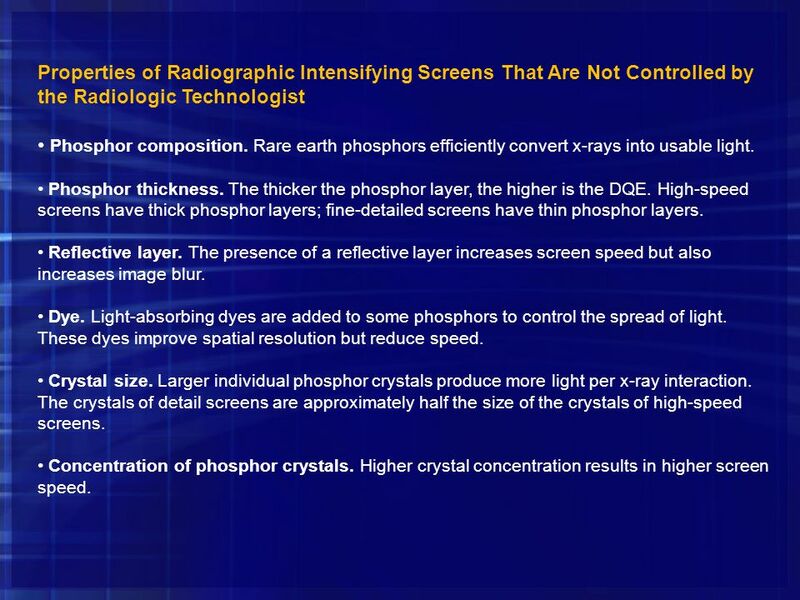 20 Properties of Radiographic Intensifying Screens That Are Not Controlled by the Radiologic Technologist • Phosphor composition. Rare earth phosphors efficiently convert x-rays into usable light. • Phosphor thickness. The thicker the phosphor layer, the higher is the DQE. 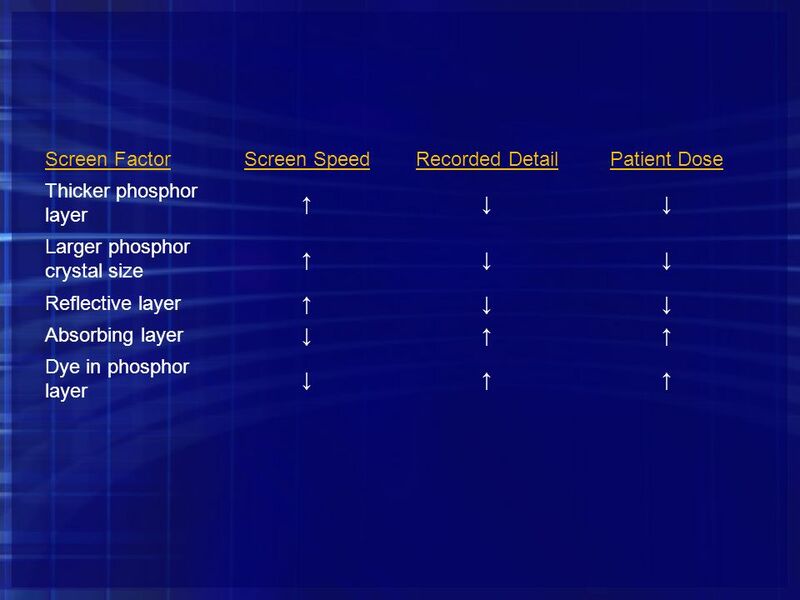 High-speed screens have thick phosphor layers; fine-detailed screens have thin phosphor layers. • Reflective layer. 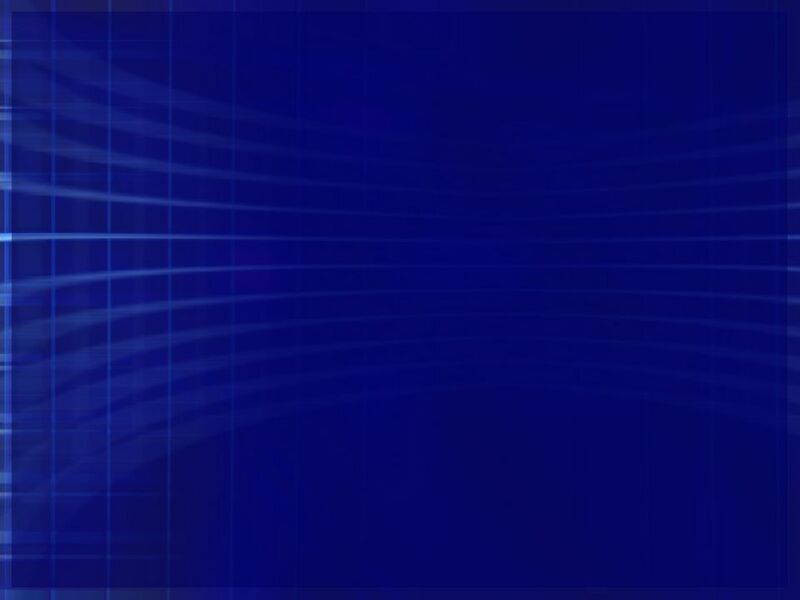 The presence of a reflective layer increases screen speed but also increases image blur. • Dye. Light-absorbing dyes are added to some phosphors to control the spread of light. These dyes improve spatial resolution but reduce speed. • Crystal size. Larger individual phosphor crystals produce more light per x-ray interaction. The crystals of detail screens are approximately half the size of the crystals of high-speed screens. • Concentration of phosphor crystals. Higher crystal concentration results in higher screen speed. • kVp As the kVp increases so is the speed of the screen. • Temperature As the temperature of the screen increases its speed will decrease • Age As the age of the screen increases its speed will decrease. 23 Quantum Mottle Quantum mottle, commonly called image noise, can be defined as the statistical fluctuation in the quantity of x-ray photons that contribute to image formation per square millimeter. When a very low number of photons are needed by the intensifying screens to produce appropriate image density, the image appears mottled or splotchy. This appearance can also be described as a “salt and pepper look,” versus a consistent, homogeneous density. This mottled appearance is often a direct result of using very fast speed film-screen systems that require very small amounts of exposure. 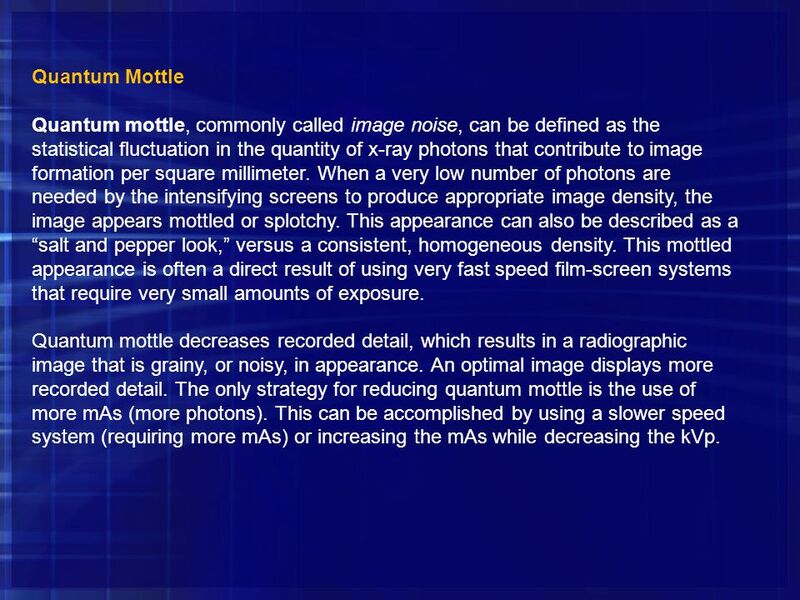 Quantum mottle decreases recorded detail, which results in a radiographic image that is grainy, or noisy, in appearance. An optimal image displays more recorded detail. The only strategy for reducing quantum mottle is the use of more mAs (more photons). This can be accomplished by using a slower speed system (requiring more mAs) or increasing the mAs while decreasing the kVp. Screen speed and density are directly proportional. 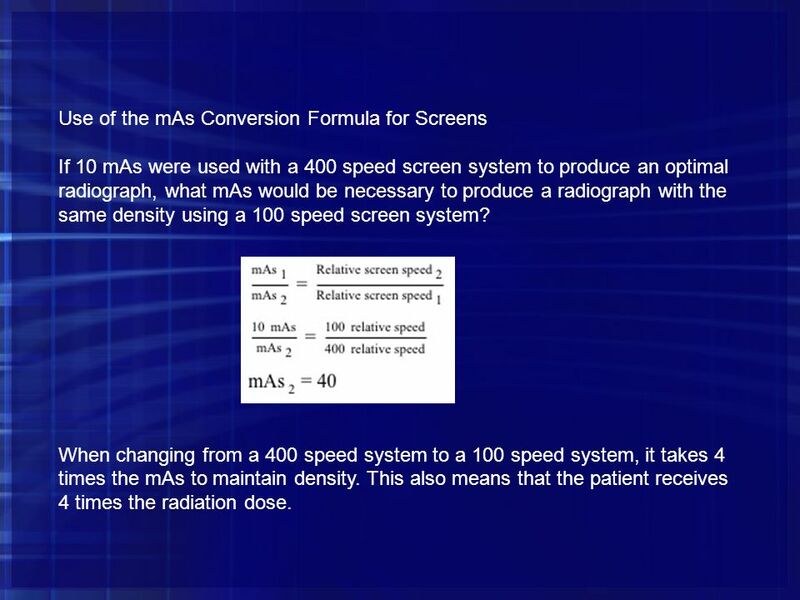 The mAs conversion formula for screens is a formula for the radiographer to use in determining how to compensate or adjust mAs when changing intensifying screen system speeds. If 10 mAs were used with a 400 speed screen system to produce an optimal radiograph, what mAs would be necessary to produce a radiograph with the same density using a 100 speed screen system? 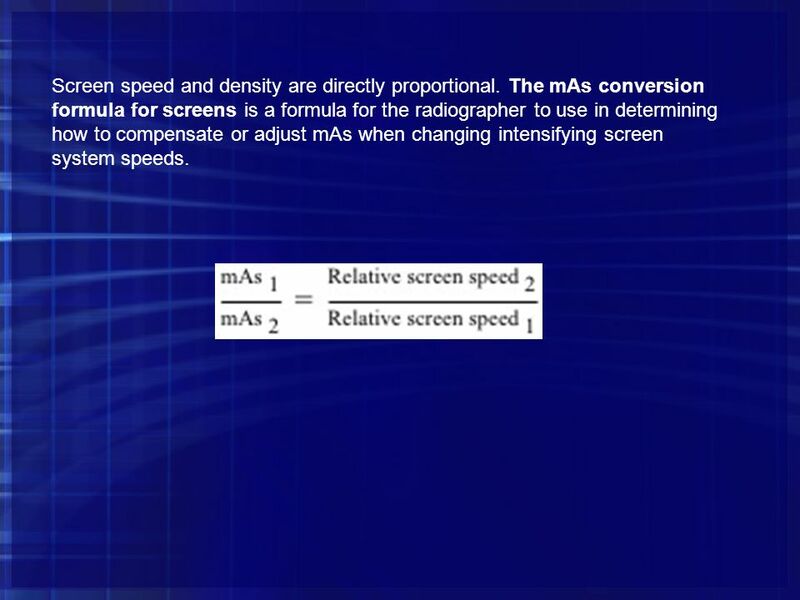 When changing from a 400 speed system to a 100 speed system, it takes 4 times the mAs to maintain density. This also means that the patient receives 4 times the radiation dose. 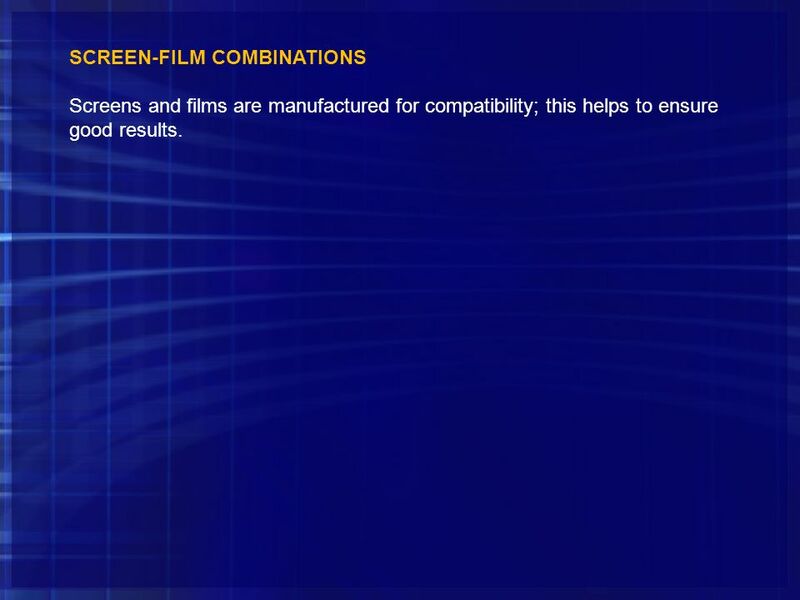 Screens and films are manufactured for compatibility; this helps to ensure good results. 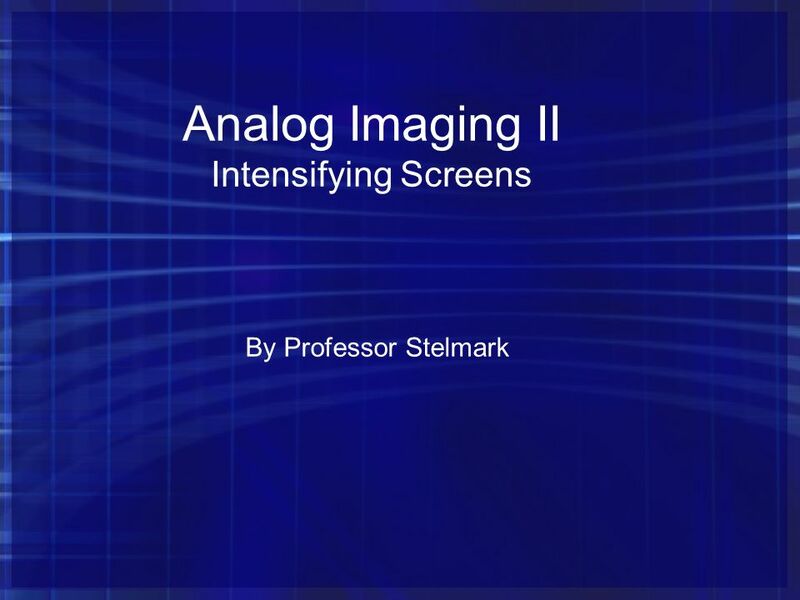 Download ppt "Analog Imaging II Intensifying Screens"
IMAGE FORMATION  Introduction  The Invisible and Visible Image  Image Characteristics. 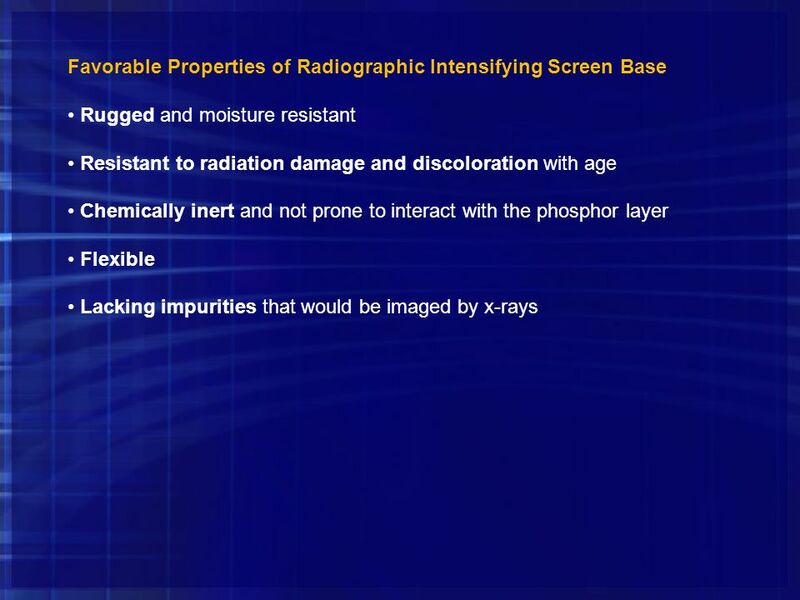 Chapter 7 Radiographic Image Formation and Exposure Factors. Topic 3 Selection of kV High kV scattered radiation is energetic. Angle of rays is same as those of primary beam and is not deflected very much. Follows. Analyzing the Image Density. Density Overall blackening of the image.